Eos Systems Inc. introduces photogrammetry software optimized for photographs taken with drones. Eos Systems Inc. has introduced photogrammetry software optimized specifically for photographs taken with drones or unmanned aerial systems (UAS). The PhotoModeler UAS 2016 software creates 3D models, measurements, and maps from photographs taken with ordinary cameras built-in or mounted on drones. It includes features for optimized operation with drone photos including post processing kinematics (PPK), volume objects, geographic coordinate systems support, multispectral image support and control point assist. Eos Systems is offering the new software at $2275, 35 percent off the normal price, from Nov. 1 to Nov. 30, 2016. 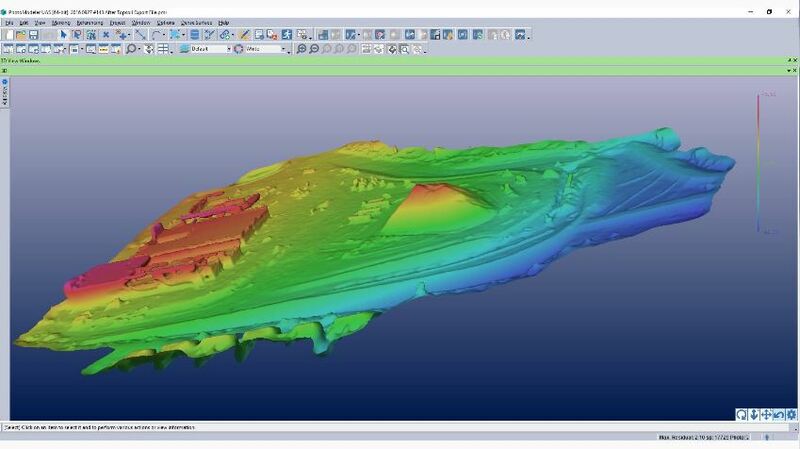 The new version of PhotoModeler is suited for drone photogrammetry applications including surveying, ground contouring, surface model creation, stock pile volume measurement, mining and mine reclamation, environmental analysis, slope analysis, forensic analysis, construction, and agricultural crop analysis. New applications for drone photogrammetry are developed monthly. Eos PhotoModeler was introduced 23 years ago and is a photogrammetric software platform with a range of users in fields such as architecture, engineering, surveying, research, manufacturing and forensics. PhotoModeler UAS 2016 software includes features that provide performance in drone photogrammetry. Camera calibration is optimized for accuracy with UASs and the global positioning system (GPS). Post processed kinematics (PPK) makes it possible to correct a survey with GPS data after the fact for survey grade accuracy. Volume objects provide easy and accurate volume data for stock piles and mining operations. Full geographic coordinate system support enables users to work in their local geographic coordinate system for better compatibility. Support is provided for multispectral images including Normalized Difference Vegetation Index (NDVI) surface models and ortho-mosaics for agriculture. An interface is provided for marking ground control points. This article is intended for educational purposes only and should not be construed as legal advice. For legal advice about the use of drones, contact an attorney. The 21st century has brought with it explosive growth in technology that is changing the world we live in on a daily basis. New innovations are allowing for more efficient ways to do business in various industries; the construction industry is no exception. Among the more controversial innovations with vast potential to revolutionize construction work is the Unmanned Aircraft System, or UAS, which is more commonly known as a drone. These remote-controlled flying robots have already found their way onto construction sites around the country, and use is proliferating as entrepreneurs discover more ways to apply drones to commercial uses. Although drones may yield numerous benefits to contractors, they have also created a need for new regulations to allow them to fit into the national legal landscape. As a result, contractors wishing to employ drones on their construction sites must be aware of such regulations. The application of drones to construction work has begun to yield advantages in several areas, including marketing, inspections and surveys. Traditionally contractors have presented their ideas and progress to their customers through a combination of diagrams and photographs of the site. Drones allow contractors to show off their work in a new way. By attaching a video camera to a drone and sending it through and around a construction site, contractors can provide customers a fully immersive virtual tour of the site, including aerial views and observations of areas that otherwise would be difficult to reach. This new marketing tool will surely be a boon by visually enhancing the viewer’s experience. Drones also have the potential to more efficiently monitor the activities of workers on a job site for progress and ensure all workplace policies are being followed. Because construction sites involve the work of many people, usually in different areas that can be difficult to reach, a small flying camera can quickly and efficiently aid site superintendents in monitoring projects. Another area in which drones have begun to make an impact is surveys. In the past, surveyors have completed their work by carefully drawing lines and manually measuring distances. Today, drone technology allows for much larger areas to be covered in much less time. A drone can be synced with GPS technology to create a quick, reliable, mobile mapping system or with thermal imaging systems for thermodiagnostics, assessment of damage and estimating of projects. — Passing an initial aeronautical knowledge test at an FAA-approved knowledge testing center. — Holding a Part 61 pilot certificate other than student pilot, completing a flight review within the previous 24 months and completing a small UAS online training course provided by the FAA. Be vetted by the Transportation Security Administration, Washington. Be at least 16-years old. This certification system also allows for temporary early access in certain circumstances. For example, any person certified as a Part 61 pilot will, upon submission of an application for a permanent certificate, immediately receive a temporary remote pilot certificate so he or she does not have to wait before continuing drone work. All applicants not certified under Part 61 can still receive temporary early permission; they will receive a temporary certificate after being satisfactorily vetted by the TSA. In addition, foreign pilots must meet these requirements at least until international standards are developed.